There are currently 154 people online. Palit presents its GeForce GTX 680, a reference-based card. 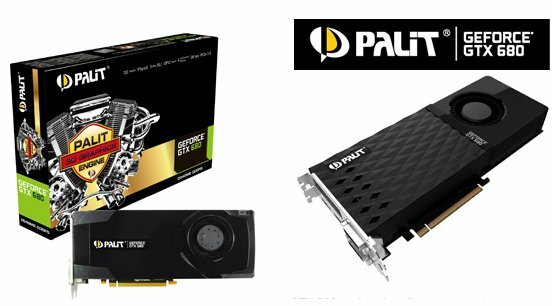 Palit Microsystems Ltd, the leading graphics card manufacturer, releases the powerful new Palit GeForce GTX 680 and its delivers more than just state-of-the-art features and technology. It gives you truly game-changing performance that will transform the way you experience all your favorite titles-now and in the future. Armed with 1536-core GPU that clocked at 1006MHz and 2GB of GDDR5 memory at 6GHz, Palit GeForce GTX 680 simply is the world’s fastest Dx11 graphics card. The NVIDIA brand new Kepler architecture which delivers the astonishing DirectX 11 gaming experience that can devastate competing GPUs with ease by offering 40% higher performance than previous generation. And with new NVIDIA 3D Vision Surround technology, you can now have the optimized 3D gaming under multi-monitor setting from a single Palit GeForce GTX 680. In addition, the brand new Kepler architecture with the exciting NVIDIA GPU Boost technology, that can dynamically maximize clock speeds to bring out the best in every game. It allows this GeForce GTX680 automatically boost its graphics card up to 5% to 1056MHz based on your GPU usage condition. Immerse yourself in an ultra-smooth gaming experience with exciting new NVIDIA technology advancements like NVIDIA Adaptive vertical Sync. It’s a fast, seamless way to adjust VSync to your current frame rates for maximum playability. The Palit GeForce GTX 600-series architecture enables NVIDIA 3D vision Surround multi-monitor gaming on a single GPU for the first time(three gaming monitors plus one accessory display.) Plus, it delivers supercharged NVIDIA PhysX and 3D Vision performance for a rich, immersive experience-every time. Palit GeForce GTX 680 is perfect for multi-monitor high-res 3D gaming. While connecting THREE Palit GeForce GTX 680s in 3 way SLI, you can create the most powerful gaming rig you ever have! Palit understands gamers’ needs, this original board design will never satisfy gamers appetite. To ensure the extreme performance and stability, the new thermal design of Palit GeForce GTX 680 performs better overclocking ability. With its stunning Diamond check thermal outlook design, Palit GeForce GTX 680 offers gamers more outstanding options to experience groundbreaking gaming performance. Be exciting, this Palit GeForce GTX 680 will be ready very soon in your market. Discover truly fame-changing innovation today. Get your Palit GeForce GTX 680 and explore the power and performance of the new GeForce GTX 600-series architecture for yourself.